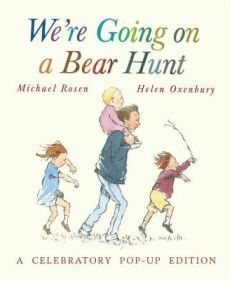 ‘We’re Going on a Bear Hunt‘ is a lovely story book by Michael Rosen and Helen Oxenbury. Essentially it tells the story of a family (Dad and three children) going to look for a bear. this is not an easy task as they have to go through grass, a river, a forest, mud and a snowstorm until eventually that arrive at a cave where they find a bear. They have been really brave throughout their adventure but… when they come face to face with the bear they suddenly discover they are not so brave and have to retrace their steps VERY quickly!! Finally they arrive back at their home, run upstairs and hide under the covers where they are safe! Both my daughters love this book because although it is a simple storyline there is so much in it. My daughters love the repetitive language because they know it so well and are able to join in. My daughters love joining in with this and know the words so well that when we are out walking through our local country park and walking through the grass and the trees they recite it and act out the story! Then we have lovely illustrations of the family wading through grass, mud, snow etc with some fantastic language to go with it – ‘swishy swashy’ to go through the grass, ‘squelch, squerch’ to go through the mud! My daughters love these words and they enjoy language and making up other words as well! It especially helps them to discuss their feelings of fear and the things that might make them anxious! This is a lovely book to share with children with so much to talk about. It especially helps them to discuss their feelings of fear and the things that might make them anxious! ‘We’re Going on Bear Hunt’ is a lovely story book and I recommend it to all parents of young children! 2 Comments on "We’re Going on a Bear Hunt"
Just to add that this book can be a great introduction to (early) reading – the storyline is gripping :-), yet the words and sentences are simple. There was a sense of real achievement in my 5-year old when he read this whole ‘proper’ book all on his own! fyi, the paragraph ‘We can’t go over it! We have to go through it!’ should actually be ‘We can’t go over it!